It was party time at the Planet Labs satellite factory, in an unkempt office in the trendy South of Market neighborhood here. A man in a blue tuxedo shared pancakes with about two dozen young engineers at the space start-up. The air was filled with the smell of bacon and the voices of Russian and Japanese astronauts. The astronauts communicated over a video hookup to the International Space Station, 230 miles above the kitchen, one morning last month. “Now we’re going to push the boundaries,” said Chester Gillmore, the company’s director of manufacturing. He was referring to his cooking skills, but he could just as well have been talking about his 40-employee company, which has already put dozens of small satellites in space. Once they are connected, they will be able to provide near-constant images of what is going on back on Earth. And that, Mr. Gillmore believes, could be the basis of a very good business. Silicon Valley, not content with changing how retailers, taxi companies and hotels do business, is taking its disruptive ways into outer space. Several young companies with roots in Silicon Valley are trying to elbow their way into a business long dominated by national governments and aeronautics giants like Boeing. Space Exploration Technologies, or SpaceX, started by the Tesla founder Elon Musk, is already a contractor for NASA, running supply missions to the International Space Station. Another start-up, Masten Space Systems, with headquarters in Mojave, Calif., is developing rockets designed for unmanned research flights. Skybox Imaging, based in Mountain View, Calif., makes satellites similar to those of Planet Labs, though they are significantly larger. These start-ups have one thing in common: They think they can undercut the old guard with lower prices and smarter thinking. While the Planet Labs staff ate pancakes that morning in February, two shoebox-size nine-pound pods made in the company’s unconventional factory floated from the International Space Station toward a polar orbit of Earth. Ten hours later, two more were released. The plan was to launch two to four a day, for a configuration of 28 satellites. The small, basic devices with solar panels and simple maneuvering equipment and radios are expected to last two to four years and are capable of taking weekly photos with details as small as a car. But that is just the start. Last week, Planet Labs announced that it would put about 100 satellites into space from the United States and Russia, bringing the total number of “Doves,” as the company calls them, to 131. That larger network, which Planet Labs hopes to complete within a year, is expected to create a daily photo mosaic of most of Earth. That mosaic could be valuable to private customers, like agricultural companies monitoring farmlands, or even to governments trying to figure out how to aid natural disaster victims. The company has so far booked contracts worth more than the $65 million in private equity it has raised, according to Will Marshall, the company’s co-founder and chief executive. Working from what he calls a “clean-ish room,” separated from the kitchen by some loose plastic sheets, Mr. Gillmore and a small team are working on newer versions of the lightweight satellites, adjusting and improving them with the frequency you would normally see at a software company. The satellites now in space are the seventh version; versions eight through 10, which are expected to cost less and do more, are being assembled. Planet Labs will not disclose its manufacturing costs, but potential customers who have seen the products think the satellites are approximately 95 percent cheaper than most satellites, a figure Mr. Marshall would neither confirm nor dispute. “We leverage the billions of dollars spent on the consumer mobile phone business” for most of the company’s parts, he said. Launch costs, which are mostly based on weight and distance above the planet, are also lower. All 28 satellites together weigh about 126 pounds and can easily hitch a ride on rockets carrying other space cargo. In comparison, a single Landsat, a popular Earth-imaging satellite, weighs 4,566 pounds and flies twice as high. 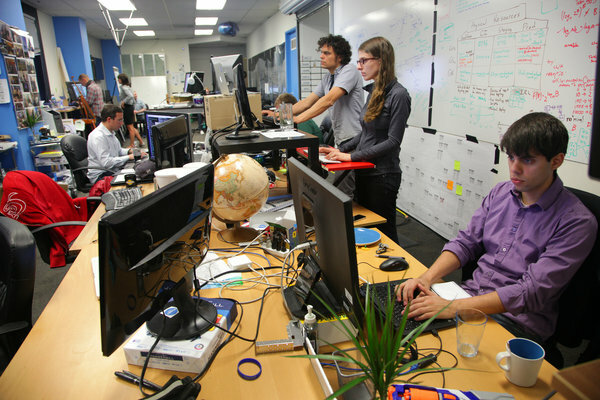 Planet Labs was founded in 2010 by three scientists who worked at NASA. Mr. Boshuizen is Australian, while Mr. Marshall is British. The third, Robbie Schingler, is an American who is the company’s chief operating officer. Like many tech entrepreneurs, all three grew tired of the conventional way things were built — in this case, space products. For example, the cost of designing, building, launching and monitoring the government’s Landsat satellite, which takes pictures of Earth from 480 miles up, is over $1 billion, according to the United States Geological Survey, which administers data from the satellite. Breaking into a field dominated by big companies with long government contracts is tough to do. And doing it cheaply is even harder. 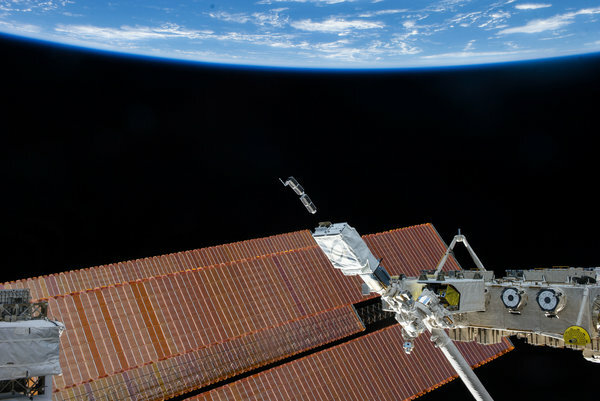 In designing their satellites, Planet Labs threw out things like propulsion systems, because of the high cost and weight. Instead, the satellites use commercial light sensors, accelerometers and motors to orient their cameras. Laptop batteries were chosen because a more expensive version cost too much. Plus, they fit inside the satellite’s frame. By making little machines that are often updated, Mr. Gillmore said, “we’re building satellites with computers that are six months old. Lots of satellites have 10-year-old computers.” Version nine, which is almost complete, cost about 35 percent less than the current version in space, and was made four times faster, he estimated. Should Boeing be worried? Not yet, said James P. Lloyd, associate professor of astronomy and mechanical and aerospace engineering at Cornell University. Professor Lloyd said he believed the space market was big enough for expensive Boeing systems and cheaper alternatives from start-ups. “Essentially anybody can do it, because a combination of miniaturization, simplification and availability of technology for building small satellites has made it accessible in a way that has never been before,” he said. Also, while Planet Labs can beat older competitors on price, those expensive features do matter, said David Friedberg, chief executive of Climate, an agricultural data analysis firm owned by Monsanto. Monsanto buys data from several older imaging satellites, he said, but is not a Planet Labs customer because it does not yet offer the infrared imagery needed to judge the health of plants. “Their real competition may be drones,” he said. Still, Mr. Marshall is confident that his fast and cheap method will hold its own.